Thomas prepared carefully for the move across the Atlantic, bringing with him three reference letters.2 The first, a character reference dated April 11, 1821, said that in the 16 years Thomas had lived in Belfast, he had behaved honestly and soberly, and was “in every way a decent respectable man.” The second stated that he had served loyally for nine years in the Belfast 2nd Company of Yeoman Infantry (a militia unit). The third noted that Thomas had been in the service of Mr. Thomas Battersby of Belfast for 15 years. Whether these references were helpful to Thomas once he reached Upper Canada is not clear, because he became a farmer and his own boss. According to the 1861 agricultural census,4 Thomas put half of the 100-acre Concession II, Lot 29 under cultivation for crops, producing primarily turnips, oats, peas and fall wheat. Twenty acres were pasture and 15 were left wooded. At that time, he estimated the cash value of the farm at $8000. At first, Thomas and Sarah lived in a log house. 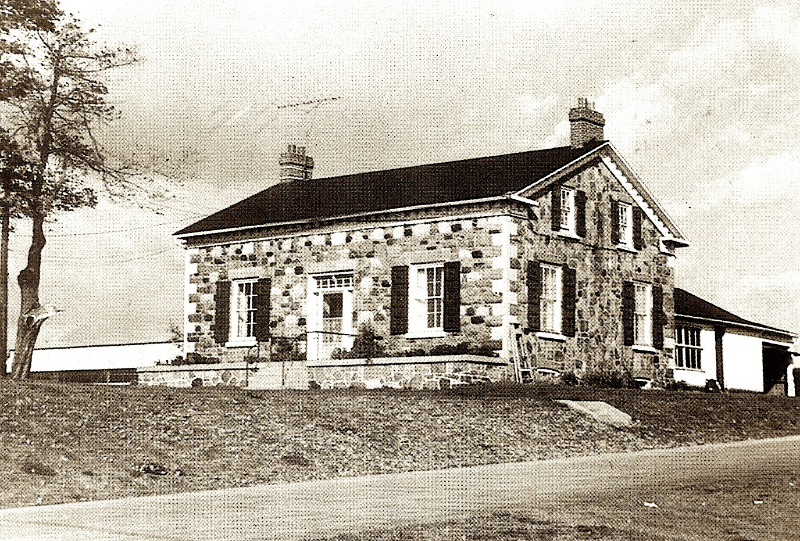 In 1854, they constructed a handsome stone house, which was demolished in 1989 to make way for a hotel. Perhaps one reason Thomas and Sarah decided to leave Ireland was the ongoing political turmoil there. But Canada had its own problems in 1837 as rebels in both Upper and Lower Canada demanded more responsible government. A conservative in politics,5 Thomas no doubt disagreed with the rebels. According to a family story,6 Thomas and his two eldest sons, James (an ensign in the local militia) and Daniel, were involved in a skirmish between the untrained rebels and the local militia at Montgomery’s Tavern in Toronto. I have not yet been able to confirm that the Whitesides were there. Although the rebellion collapsed that day, a few years later responsible government was established in Canada. Margaret Whiteside married local farmer John Glendinning. Their daughter Isabella Glendenning (the spelling of the name has varied) married James Hamilton and moved first to Saskatoon, then to Winnipeg.8 They are my ancestors, making Thomas and Sarah Whiteside my three-times great grandparents. Daughter Jane Whiteside married a local man, William Abraham, and daughter Sarah also married a man from Scarborough, John Crawford. John, the youngest son, lived on Concession II, Lot 28 and married Margaret Brown. According to several family trees on www.Ancestry.ca, he died in British Columbia. Thomas Whiteside Jr. took over Concession II, Lot 29 and married Jane McCowan. In 1892 he sold his property in Scarborough and bought Glen Farm in Innerkip, Oxford County, Ontario. 1. Thomas’s death certificate puts his age at death as 89. It adds that he was Presbyterian, and was born in County Antrim, Ireland (now part of Northern Ireland.) At the bottom of the page, a note adds that Thomas and his wife came to Canada in 1822 and lived in Scarborough for 48 years. “Ontario, Canada, Deaths, 1869-1938, 1943-1944, and Deaths Overseas, 1939-1947” digital image, Ancestry.ca (www.ancestry.ca, accessed Nov. 7, 2016), entry for Thomas Whiteside, Dec. 7, 1870, citing Archives of Ontario; Toronto, Ontario, Canada; Series: MS935; Reel: 2. 2. During a recent visit to the archives of the Scarborough Historical Society, I discovered these reference letters in a box of Whiteside family documents (Scarborough Archives, Whiteside Papers, Ref. # 1.04.29). They were donated to the archives in 1983 by Helen Richmond Smith (Whiteside) of Sidney, B.C. 3. This information was provided by the Scarborough archivist from microfilm of the Ontario land records. 4. “Census Returns For 1861; Roll: C-1087-1090,“ digital image, Ancestry.ca (www.ancestry.ca, accessed Nov. 7, 2016), entry for Thos Whiteside; Ancestry.com and The Church of Jesus Christ of Latter-day Saints, citing 1861 Census of Canada, Library and Archives Canada; Ottawa, Ontario, Canada. 5. History of Toronto and the County of York Ontario, Volume II, Toronto: C. Blackett Robinson, publisher, 1885, p. 281. 6. This story is mentioned in an article about the Whiteside family in a printed binder called James McCowan Family from 1833, p. 82, available on the bookshelf of the Scarborough Historical Society. 7. The article on the Whitesides in the James McCowan Family from 1833, p. 82, lists the children of Thomas and Sarah and gives their birth and death dates. I looked for these individuals on www.Ancestry.ca, www.findagrave.com and www.familysearch.org and confirmed or corrected whatever I could find. Some of the birth dates are on the gravestones, others are calculated from age at death. 8. Janice Hamilton, “Isabella Hamilton the North-West Rebellion,” Writinguptheancestors.blgospot.ca, Nov. 8, 2013, http://writinguptheancestors.blogspot.ca/2013/11/isabella-hamilton-and-north-west_8.html. 9. Most of the information about Thomas, James and Daniel Whiteside comes from the family history printed binder James McCowan Family from 1833, at the Scarborough Historical Society archives.